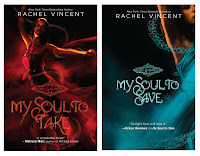 About the Books: Book 1 of The Soul Screamers series -- My Soul to Take -- was released this past summer, and readers found out why Kaylee Cavanaugh screams bloody murder when someone’s about to die. In Book 2 – My Soul to Save – when teen pop star Eden croaks on stage and Kaylee doesn’t wail, she knows something is dead wrong. She can’t cry for someone who has no soul. The last thing Kaylee needs right now is to be skipping school, breaking her dad’s ironclad curfew and putting her too-hot-to-be-real boyfriend’s loyalty to the test. But starry-eyed teens are trading their souls for a flickering lifetime of fame and fortune in exchange for eternity in the Netherworld—a consequence they can’t possibly understand. Kaylee can’t let that happen, even if trying to save their souls means putting her own at risk. Soul Screamers: The last thing you hear before you die. Get a sneak peek at the series: You can learn more about Kaylee by downloading the free Soul Screamers prequel My Soul to Lose. Um... I don't know if my form submitted. Could you tell me if me went through? I follow your blog through google reader! Wonderful contest! I hope you will check out mine too!